Extraordinary IT innovations at the HRH Group of Hotels recognized by APAC CXO Forum at Bangkok, Thailand HRH Group of Hotels participated in a prestigious Asia Pacific level "Business - Technology - Leadership Event" - The CIO Leadership Retreat and CISO Forum 2012 at Bangkok, Thailand, from Oct 25th - 27th, 2012. The event was organized by the APAC CXO forum, an international forum, which invited the top 100 IT leaders and eminent I.T. service providers in the Asia Pacific region. 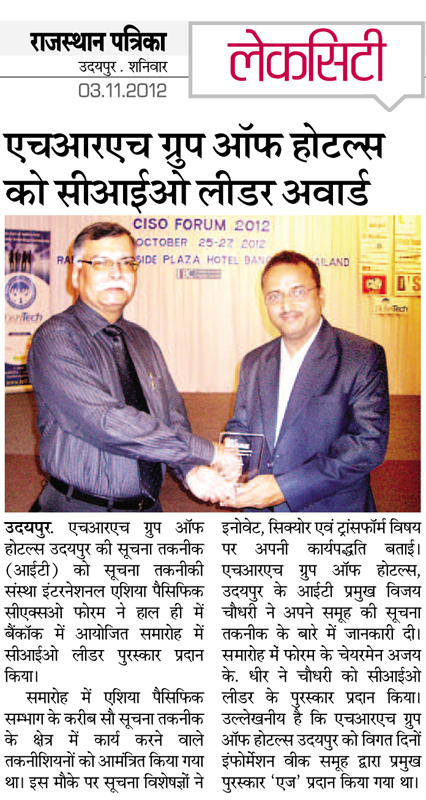 The theme of the conference was "Innovate, Secure & Transform". The event had Workshops "by CIOs - for CIOs", lessons on Leadership, Technology Sessions by eminent speakers from India as well as Thailand. It was followed by a grand ceremony of the prestigious Awards for CIOs, CISOs and Data Center Experts, hosted at the Menam Seminar and Convention Center, Ramada Plaza Menam Riverside, Bangkok. Mr. Vijay Choudhary, Head IT, HRH Group of Hotels was honored with the award CIO-Leader, presented by Mr. Ajay K. Dhir, Chairman and Founder of the APAC CXO Forum. The award recognizes a trusted guide, influential mentor and a strategic executive. It recognizes someone who is instrumental in the successful turnaround of his company & is an exceptional leader who has played an important role in his specific sector development on various levels, implemented innovative strategies in order to improve performance, and contributed to the growth of the community, environment & region as well. To maintain transparency, proper governance and a structured process of selection, the awards were judged by an independent panel of prominent society and industry leaders. Its another landmark in the journey of technological achievements for HRH Group of Hotels, EternalMewar, Udaipur.